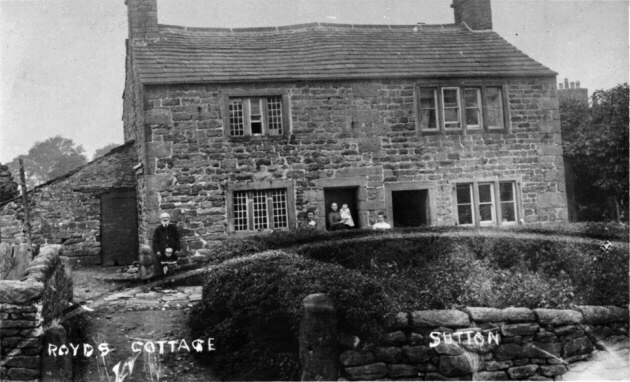 Readers may be interested to know that Royds Cottage was located at the top side of the junction of Acres Road and West Lane, Sutton. Cissy Overend who lived in the High Street until the early 1970s had a similar photograph and could recall the location of the cottage. The property is marked on the 1851 Ordnance Survey Map, which can be viewed online. The stack and chimneys to the right of the photo belong to Croft House where Mr Broughton lived, many will recall that he was the headmaster at the Church School during the 50s and 60s. The cottage was demolished by John Willy Hartley to prevent overlooking into the Sutton Hall estate. Glyn's collection also includes a photograph of Royds House Farm which stood at the bottom of Cononley Brow. I believe that the property was burnt down in the 1930s. A new farm house was built and the former front wall of the house was retained as a garden wall. With thanks to Robin Longbottom for providing this article. January 2011.